Crown Trade’s Timonox flame retardant finish has been developed to slow down the spread of flames in the event of a fire, allowing additional time for buildings to be evacuated. The Timonox flame retardant system has been designed to limit the spread of fire. The system can be applied on both walls and ceilings, and achieves the class 0 status required by legislation including the Regulatory Reform (Fire Safety) Order (RRFSO) in England and wales and The Fire (Scotland) Act 2005. 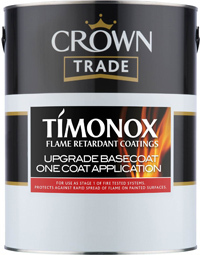 At the event, the Crown Paints’ team will discuss how advances in research and development now mean that only one coat of the Timonox Upgrade Basecoat, followed by two coats of the Emulsion Topcoat, is all that is required to offer necessary protection against the rapid spread of flames and improve a Class 4 surface to a Class 0 (previously four coats were required). The day will also include an Ask the Expert’ advice session, with Crown representatives on hand to offer guidance on subjects including fire safety legislation, in addition to specific application issues. There will also be information on colour scheming and the creation of inclusive environments provided. The event will take place between 12.30pm up to 8pm.